There are certain challenges that we can face in life that present the opportunity to learn a lot about ourselves. I think divorce is falls in that category. It’s a very difficult process to face. You’re confronted with feelings of shock and disappointment and even a mourning that you may not have expected. 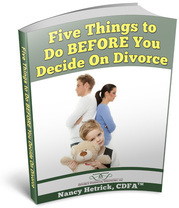 Divorce has also become such a common experience now that many view it as normal business. Until it’s personal. Until it’s you. Well, if it is you, now is the chance for a new beginning. It’s time for the second act. What did you always want to do that you put on the back burner, to focus on being a good wife and mother? What are some of the habits and practices that you’ve always wanted to change, but cold never find the time or support to focus on them? What did you learn from your marriage that you do not want to take into your future relationships? One of the best things the new beginning can offer is a better picture of what kind of life you now want to have and how to provide the financing for it. If you’ve made it all the way through the divorce process you’ve pulled together an account of your household income and expenses. Since you’ve recently had the budget laid out, now is a great time to jump back into that personal money planning mode and get ahead of it. Our money choices and habits are relatively easy to track and change. Those choices and habits can also be the root of the discord in our relationships. One of the keys to change is finding out what goes into those choices. Are you a saver, because you’ve gone without before? Are you a spender because in the past, you’ve had the luxury of not being worried about cash? As a divorcee’, you’ll learn that you are a survivor. You’ll learn that you are strong and that new things can make you stronger. You’ll learn that now is the time to start that new class, launch that new business, explore that new idea about making money doing something your love. If you need help learning how to implement a plan around your newly single financial status, Smarter Divorce Solutions is here to help you implement Smarter Money Solutions in your new life. Join us at our next Empowerment Zone meeting where we will talk about tips and tools to get you started on the path to a smarter personal financial plan.